Well, Kim Liggett sure doesn’t mess around. That was my first thought after finishing The Last Harvest, but only once I was recovered from feeling like I was thrown off a bridge thanks to that ending. This book might be published under a Young Adult imprint, but when it comes to delivering horror, it’s the real deal—no kid gloves here. To give fair warning, I would probably place this on the “older teen” spectrum, and if you don’t like unsettling themes and endings, then you may want to stay away. If, however, knowing all that only makes you more intrigued, then read on! Personally, I knew as soon as I heard about The Last Harvest that it would be right up my alley. The book was first pitched to me as a YA horror thriller, described as Rosemary’s Baby meets Friday Night Lights. 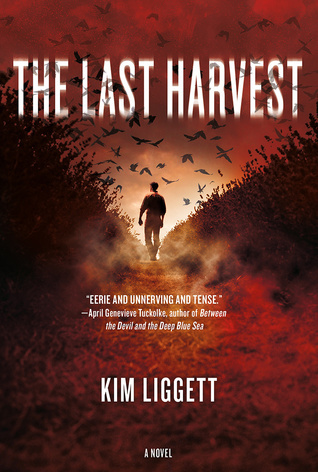 Think sprawling wheat fields, high school football, cattle ranches and satanic panic. No way could I resist. Our story is set in rural Oklahoma, starring eighteen-year-old protagonist Clay Tate. A year ago, Clay had it all—he was the star quarterback at Midland High, and as a scion of one of the six founding families of their town, he was also a well-respected member of the Preservation Society. But all that changed the night Clay’s dad lost his mind, took the living room crucifix off the wall, and made a sudden visit to Ian Neely’s neighboring cattle ranch. Now on the first anniversary of that night, people in town still talk in hushed whispers about how the elder Tate’s body was found among the blood and viscera on the floor of the breeding barn, after committing an unspeakable act. Clay himself has become a social pariah, having quit the football team and turned down his position on the Preservation Society in order to focus on working the family farm. Clay’s mom has also not yet recovered from her husband’s death, leaving him to raise his little sisters on his own. With the days growing cooler, Clay is determined to finish harvesting the wheat before first frost. But between the bad memories and his worries about his family, he’s been having trouble sleeping, and the visits to the doctor and school counselor haven’t really helped. Worse, he begins to see and hear things that he suspects aren’t really there, like the slaughtered golden calf he finds in the wheat field one morning, only to come back later to find that all traces of it has disappeared. Disturbing visions featuring his family and friends continue to haunt him, making Clay wonder if he is now suffering from the same mental illness that affected his dad in his final days. Was this what made his old man go crazy and accuse the Preservation Society of devil worship? Clay knows something rotten is definitely going on in the town, but there are few whom he could trust to tell the truth of what he’s seen. Evil has come to Midland, and now Clay fears for his family and for the soul of the girl he loves. I’ve always said, the best and scariest horror stories are the ones that make you wonder what’s real and what’s not as you’re reading. What I found most impressive about The Last Harvest was how Liggett managed to lure me into a false sense of security. She’s also good at playing her cards close to her vest. When the book begins and we meet Clay Tate, we’re aware that something bad has happened to his family and that it involves his late father, but details behind the “breeding barn incident” aren’t revealed until later. For a long time, it doesn’t appear that anything too out of the ordinary has been happening in Midland. It’s a very traditional town where everyone knows each other. Much of life revolves around church, football, and the Preservation Society. Like any population, the vast majority are good kind people, but they also have their bad eggs. So at the first signs of malaise, it didn’t set off any alarm bells in my head. Also, while a young man in his late teens experiencing the classic symptoms of schizophrenia is a distressing experience indeed, again there are no clear signs that anything supernatural may be afoot. It’s not until later on in the book that Liggett springs her trap. And that was when it hit me, I really should have been paying more attention! The author had been laying down clues since the very beginning, planting the seeds for her very own harvest, and suddenly it was all coming together. At the same time, I realized Liggett had set the story up so brilliantly that I had no idea where it was going to take me. In the end, I had to give up on trying to predict anything and simply let myself to be swept away by the plot’s many twists and turns—and believe me when I say, it was worth it. My only issue with the book is the polarizing effect it may have on its intended audience. The horror aspects are definitely intense, going a little beyond what I would have expected for a YA novel, but at the same time the story also contains clear YA genre elements including teen romance, high school drama, and a general atmosphere of teenage angst. For adult fans of horror, this might be a turnoff or even a deal breaker, and it’s a real shame because I know plenty of horror buffs for whom this book would be perfect, except they don’t read YA. I can also see readers divided on their thoughts of the ending, though personally, I loved it. Revealing much more about it will be spoiling, so just take my word for it when I say it is not to be missed. The Last Harvest surprised the hell out of me, and it was everything I wanted plus a lot more. It was surprising, and wow, that ending! I could not have ever imagined something like that myself! I like the idea of an author lulling you into a false sense of security and then pulling the rug from under the readers’ feet 🙂 IMHO there is nothing better than to be surprised – and terrified, of course – when you least expect it. It’s a great cover! And a really terrifying book. If it hadn’t been for the overt YA tones, I think this could have been a massive release for the genre!